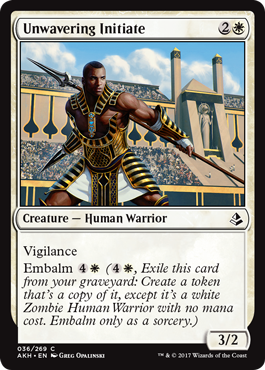 Overall Thoughts: The fact that this exiles any nonland permanent means it can get rid of an annoying planeswalker your opponent has, a troublesome enchantment, a vehicle that’s been harassing you, or your opponent’s best creature. With choices comes playability, so I believe this card will likely see play in Standard. 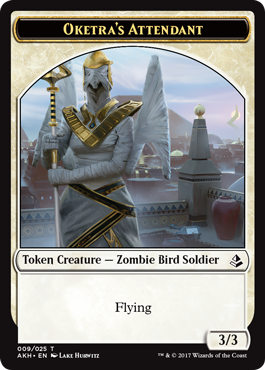 Overall Thoughts: Doubling tokens is great, but the fact that this costs 4 mana and you still need ways to create tokens on future turns limits the playability of this card. 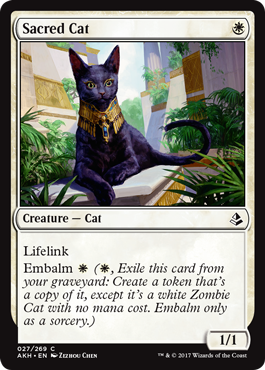 Creatures with embalm will certainly help with this problem, but this will likely only be seen in the most dedicated of token-producing decks. 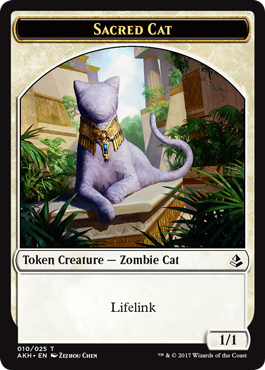 Overall Thoughts: This would get a higher rating if you gained life for each creature that entered the battlefield under your control, but since it only works when tokens enter, it’s pretty limiting. 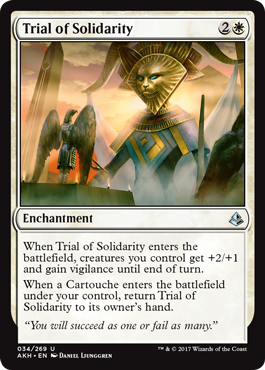 Overall Thoughts: While this is a very cool card, and I do love alternate win conditions, I don’t think this will likely see much play. People will try it. People will fail. And people will move on. 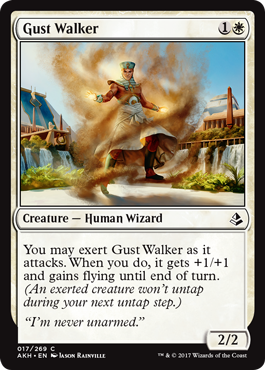 Overall Thoughts: While I don’t think this is a great card in the current Standard environment, I do think it will be fairly widely played. The 1 Toughness is a real hindrance in this format with Walking Ballista being so prevalent. Overall Thoughts: This is a prime example of a niche card. 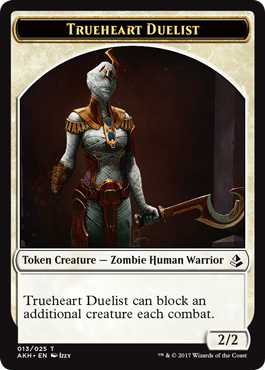 It will be seen in many decks that focus on embalm creatures or zombie-based decks, but nowhere else. 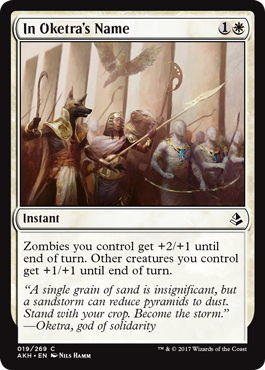 I think it’s a fine card and with so many zombies able to return to the battlefield from the graveyard, it could be a real tide turner at times. Overall Thoughts: Vigilance and first strike are good abilities, but this card is just mediocre. 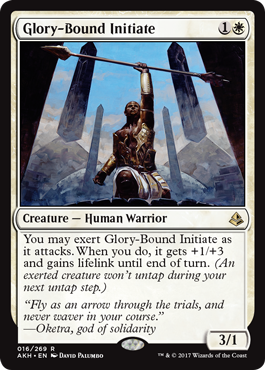 I do think this card has potential to be played in decks trying to break the Trials because of it’s low mana cost, but it’s not likely to be a game changer for you. Overall Thoughts: Another card that exiles a nonland permanent. Seems good to me. And the fact that it has flash means it’ll be a nice way to blindside your opponent when they play something you can’t deal with. 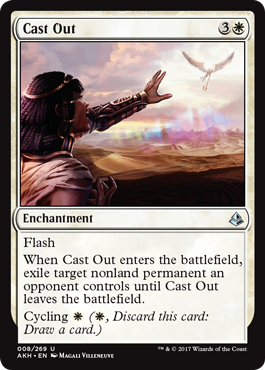 The cycling on this card seems silly though, as I really have a hard time thinking of a situation where I wouldn’t just want to keep this in my hand. Overall Thoughts: There’s very few circumstances where I could envision this card, however there are creatures that are large enough that I could see trading 2 points of life in order to get rid of it as advantageous. This won’t see much play at all, but it could see inclusion in some sideboards. Overall Thoughts: Most of the time, returning a 2 mana creature from your graveyard to the battlefield won’t have much impact on the game. 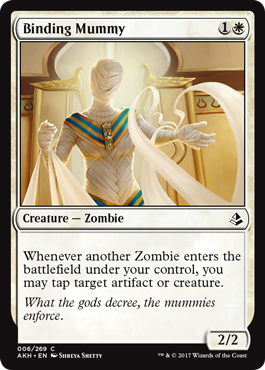 However in decks that utilize lots of 2 mana or less creatures (like a white weenie deck), I could see this card being very good. Overall Thoughts: If you need to block something and just need to keep your blocking creature alive, then this is the card for you. The problem with this is, what happens next turn? This card isn’t very good, but might pop up from time to time in decks that have benefits for cycling cards. Overall Thoughts: 2 mana to tap target creature in addition to tapping this creature is far too much of a price to pay. I don’t expect this to see play. 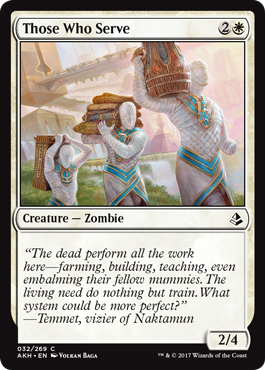 Overall Thoughts: An expensive sideboard card is all I see here. 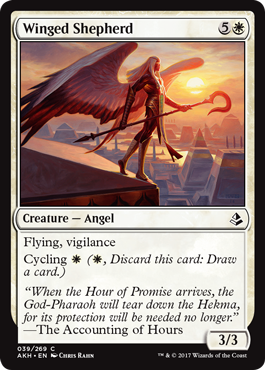 This works in a cycling deck, but even there I don’t think it’ll be in the main deck. Overall Thoughts: When this card was spoiled, people lost their minds. 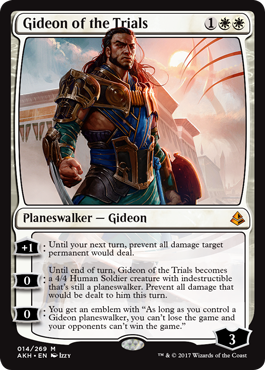 While I like the Platinum Angel-like effect, this version of Gideon really does nothing to help you actually when the game. This will see plenty of play, but in my opinion it’s only a good card, not a great one. 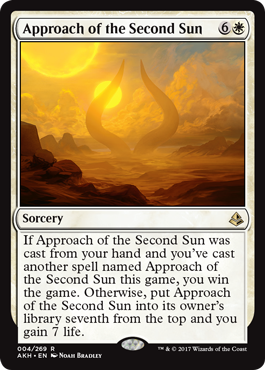 Overall Thoughts: Here’s another good sideboard card. 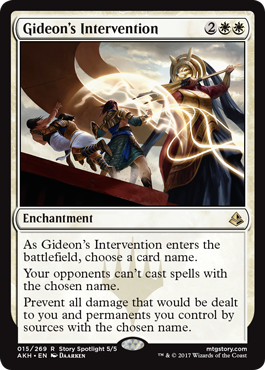 This is a good answer to an opponent’s Gideon, or to any large creature you know your opponent might play. This is also bad news for Electrostatic Pummeler if he were to see play again. 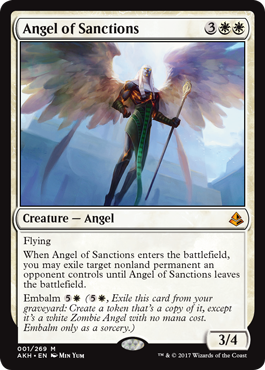 Overall Thoughts: While having a 4/4 with lifelink is very good, the fact that you’re down a creature the next turn makes this card just okay. Is it worth on missing out on potentially 2 points of damage the next turn, or trading with one of your opponent’s creatures? Maybe. Maybe not. 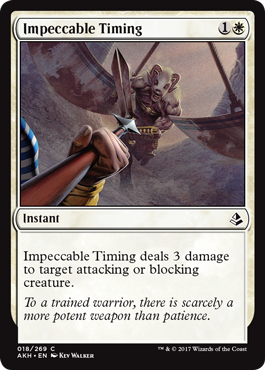 Overall Thoughts: This card has the potential to break a stalemate for you, but all-in-all just isn’t exciting. Don’t look for this to appear in lots of decks. Overall Thoughts: 3 damage is likely enough damage to deal with most of your opponent’s creatures. I think this will be fairly playable as removal in this Standard format. Overall Thoughts: Here’s another niche card specifically for zombie decks. 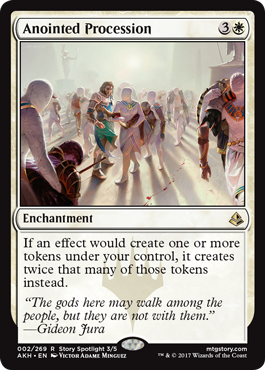 I could also see it getting some fringe play in a token-based deck, but there’s likely to be better options. Overall Thoughts: This could be good to push through the final points of damage you need to finish off your opponent, but that won’t happen very often. That’s why I don’t see this getting much play in Standard. Overall Thoughts: This card is great. With enough mana, you can singlehandedly build an army large enough to allow this god to attack or block. 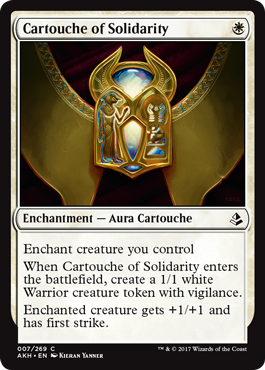 And since white is the color of small, cheap creatures, you’ll likely already have the army in place when you cast this card. This will see play. 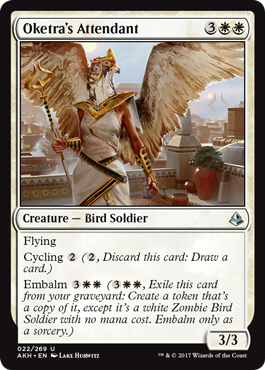 Overall Thoughts: For 5 mana, I’d like to have larger stats than 3/3, but since this has both embalm and cycling, it’ll be good enough. 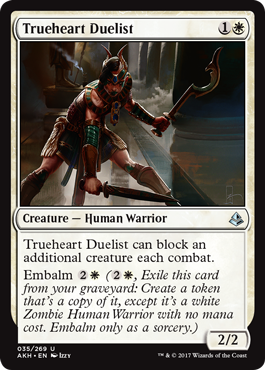 I also like the fact that the embalm cost is the same cost as the original casting cost. Overall Thoughts: If you’re playing this on turn 5, saving yourself from 1 point of damage that each creature your opponent has probably isn’t helping out too much. Overall Thoughts: I know I’m probably biased towards this card, but I think this is very good. 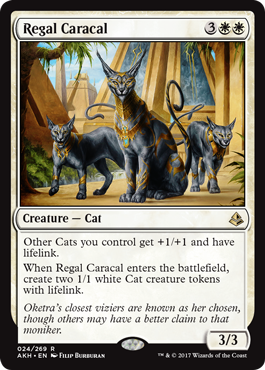 I love tribal decks, and there are enough cats in Standard to make a 2 or 3 color cat deck. Also, for 5 mana you get 7 power and toughness spread across 3 creatures, 2 of which have lifelink. Seems really good to me. 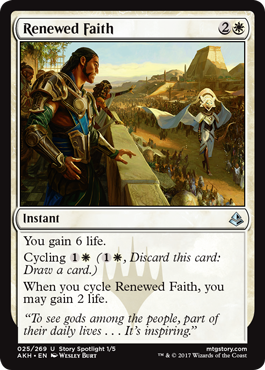 Overall Thoughts: Normally cards that only gain you life aren’t that great, but the fact that you can cycle this and still gain some life is good. This will definitely be included in cycling decks. Overall Thoughts: If the exert ability could be used while blocking somehow, it would be a more versatile ability. As it is, I don’t think forcing through 1 extra point of damage every other turn is good enough to see play. 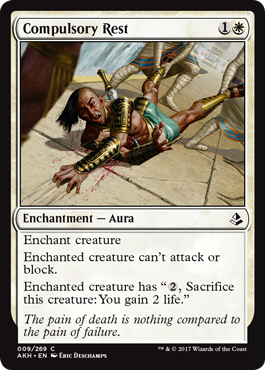 Overall Thoughts: Getting 2 creatures for 1 mana that gain you a minimum of 2 points of life seems good. And this card slots in perfectly in a cat-based tribal deck. Overall Thoughts: For 7 mana, this card needs to be bigger than 4/4. This won’t see much play as long as Grasp of Darkness is still in Standard. 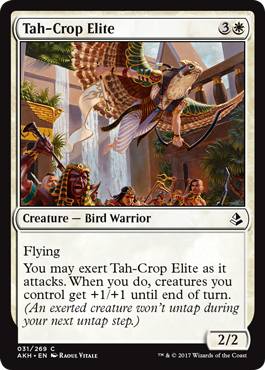 Overall Thoughts: This will likely see plan in a deck centered around exert creatures. Elsewhere, while it does have some functionality, I don’t see it being widely played. Overall Thoughts: If I have 5 mana, I’m not looking for a 3/5 creature. I want something bigger or with some sort of evasion. Sorry, Supply Caravan. You’re just not very good. Overall Thoughts: Now here’s a creature with exert I can get behind. Exerting to pump your whole team is something that feels worth doing. I think this could see play in aggressive white decks. Overall Thoughts: If you have long-term plans, then this is the 3-drop for you. Otherwise it’s just a good blocker without much punch. 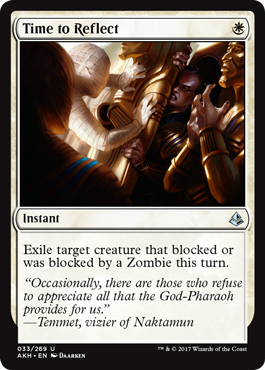 Overall Thoughts: Exiling any creature that your opponent blocks with for only 1 mana seems really strong. The zombie clause on this card won’t come up too often, but is just an added bonus. This will see lots of play. Overall Thoughts: A +2/+1 bonus is nice, and in conjunction with vigilance it’s very good. Also, being able to recast this later in the game is an added benefit. Nice card. 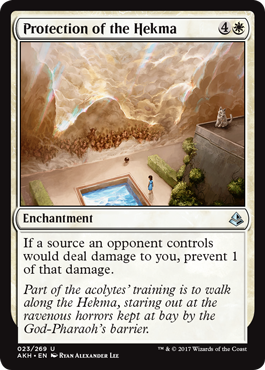 Overall Thoughts: As long as your opponent doesn’t have trample, this card can be an excellent way to protect yourself for a couple of turns. I think this will see play in quite a few decks. 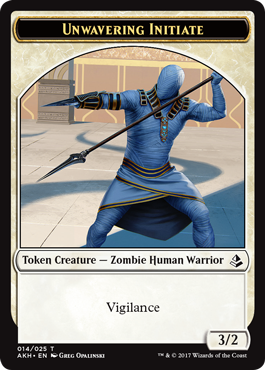 Overall Thoughts: I’m a big fan of vigilance, so it should come as no surprise that I like this card. The embalm cost is a little high, but it’s like an added bonus for the late game if there’s nothing better to do. Overall Thoughts: While I can see the advantages of playing this card, the fact that it’s basically a combat trick limits it’s playability. I do think it’s good in a deck with blinking effects though. 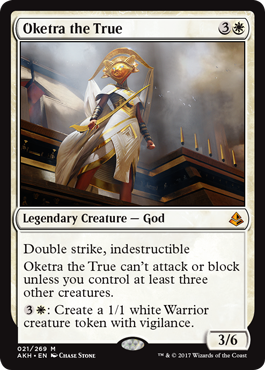 Overall Thoughts: With Amonkhet it seems that putting a -1/-1 counter on a creature you control can be used for good results. 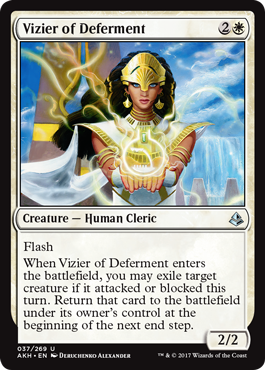 That’s why I don’t see this being more than just a sideboard card. 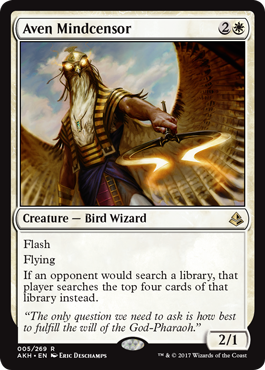 Overall Thoughts: A 3/3 flyer with vigilance is good, but not so good when it costs 6 mana. 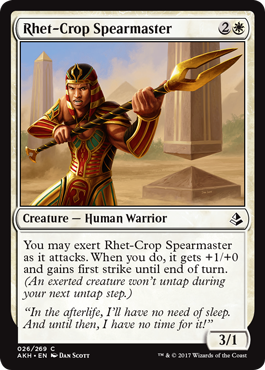 The fact that this has a low cycling cost helps make this card playable. Overall Thoughts: Aftermath cards are difficult to evaluate. The Dusk portion of this card seems very good for when you fall behind. 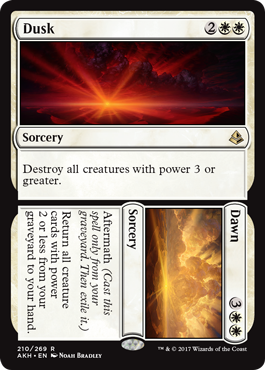 The Dawn portion of this card could be very good if your deck is built around creatures with low power. With that being said, I think this will likely see some amount of play initially, but that amount will lessen as the format goes on. 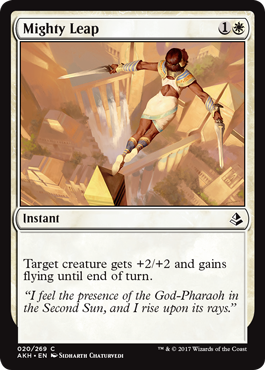 And that’s my review of the White cards in Amonkhet. Nothing stood out as an all-star, but there were a few gems to be had. What do you think? Was I spot on with my assessments, or did I miss the mark horribly? Let me know in the comments section below. And be sure to come back tomorrow for my review of the Blue cards. I’ll see you then.